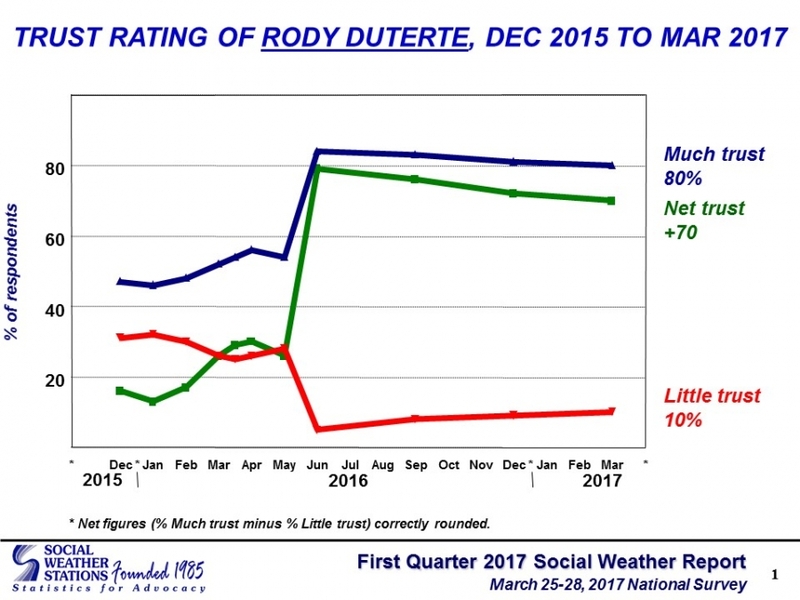 MANILA -- President Rodrigo Duterte has maintained his “excellent” trust rating from Filipinos for four consecutive quarters, the latest Social Weather Stations (SWS) survey showed. Some 80 percent of Filipinos gave Duterte a rating of “much trust,” while 11 percent were “undecided” and 10 percent responded with “little trust,” according to the survey, which was released on the SWS website on Saturday. This comes after Duterte secured a trust rating of 76 percent in a Pulse Asia Inc. survey last March. The survey was conducted for the first quarter of 2017, or January to March. According to the SWS, the survey question on trust rating "is different from satisfaction rating as the former gauges public trust in a personality as a whole, while the latter asks about public satisfaction with an individual's performance related to his/her position or duty." Duterte achieved a +70 net trust rating, “similar” to the +72 he got in December, the SWS noted. Although his trust rating fell by 6 percentage points in Balance Luzon and Visayas, it increased by 9 percentage points in Metro Manila and 4 percentage points in Mindanao. In urban areas, Duterte’s net trust rating was found consistently “excellent," where he got +72 in March and +73 in December 2016. However, his rating fell to “very good” in rural areas by 3 percentage points, to +68 in March from +71 in December. Meanwhile, his net trust rating among classes ABC rose to “excellent," by 16 percentage points to +75 from +59. It stayed “excellent” in class D or “the masa,” with +71, and it fell to “very good” in class E by 8 percentage points, to +64 from +72. Duterte is still more popular among men, with an “excellent” trust rating of +73, while his trust rating remained “very good” among women at +67. Among age groups, his net trust rating rose to “excellent” among ages 45-54 at +76. He maintained the same rating among the ages of 18-24, 25-34, and 35-44 with +76, +70, and +75 respectively, while his rating stayed "very good" among 55 and above, down 3 percentage points to +60. Duterte’s trust rating among college and high school graduates stayed “excellent,” with +79 and +76, respectively. His rating among elementary graduates and non-elementary graduates is still "very good" although down by 4 points and 6 points to +64 and +59, respectively. The survey had a sampling error margin of ±3 percent, and ±6 each for Metro Manila, Balance Luzon, Visayas, and Mindanao. It was conducted from March 25 to 28, using face-to-face interviews with 1,200 adult Filipinos. The Duterte goverment faced several controversies in the first quarter of the year. In January, news on the alleged abduction and killing of South Korean businessman Jee Ick Joo inside Camp Crame broke. The following month, Senator Leila de Lima, a staunch critic of Duterte, was arrested in February. In March, members of Kalipunan ng Damayan Mahihirap (Kadamay) occupied 4,000 houses inside government housing projects in Pandi and San Jose del Monte, Bulacan. In the weeks leading to the survey period, Magdalo Representative Gary Alejano filed an impeachment complaint against Duterte over killings linked to his war on drugs and allegations he kept secret bank accounts. Retired Davao cop SPO3 Arturo Lascañas also retracted his former statement and linked Duterte to the Davao Death Squad during this time.